Flooding is possible this weekend from heavy rain and snow melting in slightly warmer temperatures, the Environment Agency has warned. The agency said there was a risk of some localised flooding from drains, especially in Wales and west England, but homes were unlikely to be affected. The Met Office said heavy rain would move in from the west accompanied by strong to gale force winds on Saturday. The Environment Agency has 15 flood watches in place. Meanwhile, an 11-year-old girl has died in Lancashire after apparently slipping on ice outside her primary school. Naeemah Achha suffered serious head injuries in the fall in Blackburn on Thursday. She was taken to Manchester Children's Hospital where she died on Friday. Five flood watches have been issued in Wales and three each in the Anglian region and the Midlands. There are two in the South West and one each in the North East and the Thames area. The Scottish Environment Protection Agency has five "flood watches" north of the border. An Environment Agency spokesman said: "We are not currently expecting any major property flooding from rivers this weekend as they should have capacity to cope with forecast rainfall and snow melt. "However, people should be aware that there is a risk of some localised surface water flooding from overwhelmed drainage systems, particularly across Wales and western England. Severe Flood Warning: Severe flooding expected. There is extreme danger to life and property. Act now! Flood Warning: Flooding of homes and businesses is expected. Act now! Flood Watch: Flooding of low lying land and roads is expected. Be aware, be prepared, watch out. All Clear: Previous flood watches or warnings are no longer in force for this area. "The Environment Agency may issue flood watches and flood warnings for possible isolated river flooding in these areas, as heavy rain moves in from the south west on Friday evening. "Environment Agency teams are out on the ground checking for blockages in waterways, removing debris and checking flood defences as a precaution." The Met Office said rainfall of 15mm to 25mm (0.6in-1in) was expected in some parts of the UK on Saturday, with up to 40mm (1.6in) on high ground. With melting snow and ground still frozen in places there was a risk of localised flooding, it added. Temperatures are expected to fall again next week, bringing a risk of more snow and ice. Earlier, Greater Manchester Police said seven people were injured in a pile-up involving up to 10 cars on the frozen A627(M) motorway in Oldham. 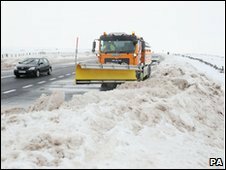 Meanwhile, the Highways Agency and councils have cut their use of salt for gritting roads by half - up from the 25% cut agreed last week - to protect supplies. Freezing conditions caused water pipes to split in many regions. Yorkshire Water has been taking 160 calls a day about the problem and has 75 teams repairing them.